Before joining BAE Systems, General Ward served 35 years with the U.S. Air Force. He retired as Director, Special Programs, in the Office of the Under Secretary of Defense for Acquisition, Technology, and Logistics. General Ward served as the principal staff assistant and advisor to the Under Secretary of Defense for Acquisition and Technology on all programs protected under special access controls. During his military career, he was the recipient of numerous awards and commendations including the Defense Superior Service Medal, which is awarded to members of the United States military who perform superior meritorious service in a position of significant responsibility. General Ward holds a BS in Meteorology from Florida State University, an MBA from Auburn University, and is a graduate of National Defense Universitys Industrial College of the Armed Forces. General, would you please tell us a little bit about yourself? And do you continue to fly? I was born during the dawning of the space age and I can remember quite vividly back to the evening of October 1957, when the Soviet Union launched Sputnik and I, as a young boy, joined my neighbors in the street to search the heavens for a glimpse of this remarkable scientific feat. That event released a passion for space within me that would stay with me forever. I wanted to become an astrophysicist and solve the mysteries of the universe. But as the fifth of eight children in a family where money was scarce, college was out of the question. Fortunately, the Air Force offered me that opportunity to go to college, so I enlisted and completed college as a Staff Sergeant. In 1969, I attended Officer Training School and was commissioned a second lieutenant. I spent the next 35 years serving in the Air Force in a variety of fascinating assignments including flying into hurricanes as a flight meteorologist, flying the C-141 Starlifter around the world as an aircraft commander, serving on the Air Staff and the Joint Staff as an action officer working command, control, communications and intelligence issues, and, of course, finding my way back to the business of space. As much as I love flying, my passion for space has kept me out of the cockpit as I decided to pursue opportunities to work in the space mission area to help build the space capabilities that will advantage and protect the soldiers, sailors, airmen, and marines that serve our country with honor and courage. Its a small price to pay. How did you manage the transition from an exceptional military career to decision-making positions in the commercial world? The transition was fairly seamless. I find that the common ingredient between the military and the commercial world is people. If you understand what motivates people, what their value proposition is, and you treat them with respect and dignity, youll find that there isnt that much difference between the two. What the military does particularly well is create an environment of trust. In combat, you have to trust the individuals you serve with to hold up their end of the bargain, as you depend on them and they depend on you  when you have shared values, when you have common objectives, trust comes more easily. In the commercial world, trust is just as important a concept, but sometimes values are not always shared, due to the competitive nature of the business. Trust is harder to develop. Certainly, decision making is far easier when conducted within an environment of trust and is always far more effective. Based on your more than 40 years experience in the aerospace and defense industry  35 years with the U.S. Air Force  what do you see as the most pressing issue(s) facing the satellite communications industry? How can these issues be addressed? Over the years, I have gained a tremendous respect for the role that space communications plays in national defense, in providing services that enrich our personal daily lives as well as for the reliance of our nation on space communications to conduct diplomatic, informational, military, and economic activities. For example, military commanders rely on space communications to provide the situational awareness that is needed to properly command and control their forces. At a time when more and more nations are flying satellites into space, and the orbital highways are becoming more congested, the risk of collision, or interference, is increasing. Our industry must do all we can to ensure space communications are not interrupted by the way we design and protect our systems and networks. Moreover, our nation must work with the international community to ensure the safe passage of goods and services in space as we have done on the ground, on the sea, and in the air. Another issue is the availability of usable bandwidth, especially during times of crisis. First responders and the military depend on satellite communications for command/control capability and communicating with governments, relief organizations, and soldiers on the ground. The industry must adapt to provide enough capacity to deliver information and bandwidth to support the needs of a variety of users. At the same time, we must realize that it is a never-ending cycle: as bandwidth is created, people develop new uses for that bandwidth, thus driving the need for still more bandwidth! One solution to this issue is to build a better network of satellites that can be joined with international partners to develop an Internet-like capability in space, allowing us all to maximize and leverage bandwidth. This way, bandwidth can be shared and moved to wherever it is needed. Of course, we would also need innovative ways to control access and transmit data, while also addressing the challenges of protecting information. I know that many companies are already developing pieces of such a comprehensive system. For example, Integral Systems has technology that monitors and protects satellite data links. However, a truly comprehensive approach will require government and industry around the globe to come together to achieve a viable, long-term solution. If you were still Director, Special Programs in the Office of the Under Secretary of Defense for Acquisition, Technology, and Logistics, what would you advise satellite communications companies to consider and present when dealing with the Defense Department? Companies must recognize they are full members of the national security community. Each satellite is an opportunity to drive additional revenue and provide more capabilities for national defense. They should work with the Defense Department to provide additional capability on current and planned satellites where it makes sense to support national security and defense. Transmitting real-time data is absolutely critical. When there are interruptions in service, we dont always know why that has occurred. Satellite companies have to be able to detect, characterize, geolocate, and report interferences to one location. With that information, appropriate action can be taken to correct the situation for the future. Prior to joining Integral Systems, you spent time at BAE Systems as Vice President and General Manager for the Space Systems and Electronics business area. How did this experience prepare you for your current position as Chief Operating Officer Integral Systems? Why did you join Integral Systems? BAE is an excellent company. I spent eight years there as a general manager with profit and loss responsibility. That hands-on experience taught me a lot about how to be successful in managing a business in the space industry. At Integral Systems, I was offered an opportunity to help shape and grow a smaller company with a unique position in the satellite command and control markets and with innovative technologies that, I believe, will make this company very relevant for the future of space and its increasing association with terrestrial networks. Integral Systems is loaded with talented and motivated employees and a strong, well-grounded leadership team. It was an opportunity to work with a company that is completely focused on serving the current and future space needs of our country with products that will help solve some of the industrys most pressing challenges in both the satellite and ground systems markets. With my passion for space, it was an offer I could not refuse. Dealing with the personnel issues within the military as opposed to a civilian environment can be a most exacting task  how do you see yourself handling such matters at Integral Systems? People are people. Although they may have different experiences and different training, I find that most people want to do a good job and feel like they are making a difference. I want to keep our employees strategically focused and innovative, while at the same time perform the task at hand. The people I dealt with in the military were of the highest caliber and I find the same is true in industry. As you step into your position, what do you see as your top three priorities? 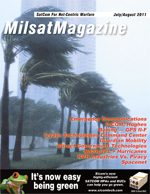 How will they impact MILSATCOM users? My priorities for Integral Systems are clear: First, we will continue to execute on our commitment to delivering value to customers and shareholders. An excellent example of this is our Command and Control System Consolidated (CCS-C) program, where we continue to deliver our satellite control solution to the Air Force on-time, on-budget, and with capabilities that have allowed the Air Force to exceed the cost and manning reduction goals of the programs. Second, we will grow the business by making the investments in people and technology that can meet the needs of our customers. We invest almost 5 percent of revenue into independent research and development (IR&D) at Integral Systems. It is a point of pride among our employees that our products and systems are known to be highly relevant, innovative and responsive to our customers needs. As an example, our employees have integrated our newly acquired satID geolocation technology into our Monics signal-monitoring product to create what we believe is the most advanced satellite signal interference detection, characterization, and geolocation solution available. We intend to continue this tradition of innovation and customer focus and bring outstanding products, systems, and services to our customers. Third, we will give our employees the means to be successful by providing them with the right training and tools as well as helping them understand how much we value their work and their dedication to meeting the needs of the nation, as well as that of the global community. How will Integral Systems work with various government agencies and the political establishment to ensure our nation remains militarily strong and steadfast in the face of so many challenges? Integral Systems serves multiple customer segments in and out of government: military, civil, intelligence and commercial. Each of these communities has a different set of needs. The military requires service at the speed of need so that they have the information they need to make decisions rapidly. Civil government needs to produce and analyze the data from sensors to support science missions at organizations, such as NASA and NOAA. The intelligence community wants exquisite data to provide the best possible information to decision makers. Commercial markets are focused on meeting their customers needs while driving revenue. In addition to understanding and meeting the needs of customers, we are also a company that deals directly with the government. Thus, we must always remember that we are stewards of the taxpayers hard-earned money. We make it a point to listen to our political leaders and to work closely with them to deliver value. How will you continue to serve the nation? I believe all of us who are patriotic citizens and members of the aerospace community continue to serve our nation each and every day. I am privileged to have an additional opportunity to leverage my experience as a former Air Force general officer and serve as a senior mentor for the Air Force Space Commands Schriever Wargames. These periodic wargames postulate a future environment and tests the capability of projected forces to engage and succeed in meeting national objectives. They help the Air Force to better understand how best to organize, train, and equip their space forces to provide the space superiority that our fighting forces need and how an alliance of our commercial and allied partners might be exercised to the advantage of the whole of governments. The lessons learned from these wargames are important factors in shaping policy and in resource allocation decisions. I am also privileged to serve in a similar capacity in support of the larger Air Forces Futures Games 09 which looks 20 years into the future to test the capabilities of projected air and space forces in a stressed environment to, once again, help shape decision making today so we are better prepared for tomorrow. It is always gratifying to work with the many talented and dedicated men and women who serve our nation today.